COMMENTS:       There is a bright star (mag=6.43) 10.60 arcmin from this position. COMMENTS:       NOTE: This INTEGRAL event is temporally(10.0<100sec) coincident with the FERMI_GBM event (trignum=488931582). COMMENTS:       NOTE: This INTEGRAL event is temporally(24.0<100sec) coincident with the FERMI_GBM event (trignum=488931582). COMMENTS:        This trigger occurred at longitude,latitude = 186.33,-9.03 [deg]. COMMENTS:        NOTE: This GBM event is temporally(10.0<100sec) coincident with the INTEGRAL event (trignum=7498). COMMENTS:       There is a bright star (mag=6.42) 10.88 arcmin from this position. a gamma ray burst lasting about 100 s has been detected by IBAS in the IBIS/ISGRI data at 22:19:30 UT of 2016 June 29. The burst had a peak flux of 2.6 ph/cm2/s (20-200 keV, 1-s integration time) and a fluence in the same energy range of about 6.e-6 erg/cmq. We imaged the field of GRB 160629A detected by INTEGRAL (trigger 7498) with the TAROT robotic telescope (D=25cm) located at the Calern observatory, France. The observations started 21s after the GRB trigger (19s after the notice). The elevation of the field increased from 39 degrees above horizon and weather conditions were good. The first image (t1=21s t2=81s) is trailed with a duration of 60.0s (see the description in Klotz et al., 2006, A&A 451, L39). It shows an increase of the optical flux until R~16.4 at 81s. This image must be analyzed more carefuly. N.B. Galactic coordinates are lon=121.0706 lat=+14.2321 and the galactic extinction in R band is about 1.2 magnitude estimated from D. Schlegel et al. 1998ApJ...500..525S. V. Sokolov, A. Valeev, A. Moskvitin and V. Komarova (SAO RAS) report on behalf of a larger team. We observed the error box of INTEGRAL GRB 160629A (Gotz et al. GCNC #19621) with the SAO RAS 6-meter telescope BTA + Scorpio. The observations started since ~10 minutes after the trigger. Several images in Rc band were obtained. This object is consistent with the OT reported by Klotz et al. (GCNC #19622). We used USNO-B1 star 1669-0002297 (R.A = 00:19:31.12; Dec. = +76:57:41.3) with R2 = 15.53 for the calibrations. Preliminary magnitudes of OT are as following. "At 22:19:38.28 UT on 26 June 2016, the Fermi Gamma-Ray Burst Monitor triggered and located GRB 160629A (trigger 488931582 / 160629930), which was also detected by the INTEGRAL/IBAS (Gotz et al. 2016, GCN 19621) The GBM on-ground location is consistent with the INTEGRAL position. The event fluence (10-1000 keV) in this time interval is (1.9 +/- 0.1)E-05 erg/cm^2. The 1-sec peak photon flux measured starting from T0+14.1 s in the 8-1000 keV band is 5.6 ph/s/cm^2. =EF=BF=BDFollowing the detection of GRB 160629A by INTEGRAL (Gotz et al. GCNC 19621), optical spectra of the optical counterpart (Klotz et al. GCNC 19622, Sokolov et al. GCNC 19623) were obtained at both the 6.0m BTA telescope in Zelenchuk (Russia) and at the 10.4m GTC in La Palma (Spain) starting at 22.57 (June 29) and 4:39 (June 30) UT (i.e. 0.6 and 8.3 hr postburst) respectively. A preliminary analysis shows a deep Lyman-alpha trough and several metal absorption lines (SiII, SiII*, CII, SiIV, CIV, FeII, and AlII, amongst others) at a common redshift of z =3D 3.332, which we propose to be the redshift of the GRB host galaxy." 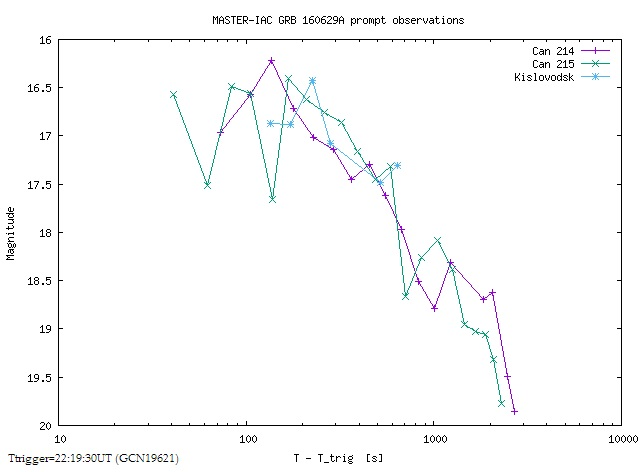 The long GRB 160629A (INTEGRAL detection: Gotz et al., GCN 19621; Fermi GBM observation: Toelge, GCN 19628) triggered Konus-Wind at T0=80385.314 s UT (22:19:45.314). The light curve shows a smooth pulse with a total duration of ~40 s. The weaker subsequent emission is traceable up to ~T0+70 s. The emission in the main pulse is seen up to ~4 MeV. As observed by Konus-Wind, the burst had a fluence of 1.5(-0.4,+0.6)x10^-5 erg/cm2, and a 64-ms peak flux, measured from T0+10.560 s, of 1.4(-0.3,+0.3)x10^-6 erg/cm2/s (both in the 20 keV - 10 MeV energy range). The time-averaged spectrum (measured from T0 to T0+24.832 s) is best fit in the 20 keV - 5 MeV range by the GRB (Band) function with the following model parameters: the low-energy photon index alpha = -0.79 (-0.17,+0.23), the high energy photon index beta = -2.92 (-3.68,+0.50), the peak energy Ep = 227 (-41,+41) keV, chi2 = 76/76 dof. Assuming the redshift z=3.332 (Castro-Tirado et al., GCN Circ. 19632) and a standard cosmology model with H_0 = 70 km/s/Mpc, Omega_M = 0.27, and Omega_Lambda = 0.73, we estimate the following rest-frame parameters: the isotropic energy release E_iso is ~3.7x10^53 erg, the peak luminosity L_iso is ~1.5x10^53 erg/s, and the rest-frame peak energy of the time-integrated spectrum, Ep,i, is ~980 keV. MASTER-Kislovodsk robotic telescope (MASTER-Net: http://observ.pereplet.ru) located near Kislovodsk was pointed to the GRB160629A 201 sec trigger time at 2016-06-29 22:24:11 UT. On our first (20s exposure) image we found 1 optical transient within INTEGRAL error-box (ra=00 20 16 dec=+77 04 43 r=0.051667) brighter then 18.5. (Cf. with TAROT coordinates Klotz et al., GCN 19622 and Sokolov et al., GCN 19623). Swift-XRT has performed follow-up observations of the INTEGRAL-detected burst GRB 160629A (Gotz et al. GCN Circ. 19621), collecting 2.6 ks of Photon Counting (PC) mode data between T0+77.1 ks and T0+89.3 ks. with an uncertainty of 3.4 arcsec (radius, 90% confidence). This position is 111 arcsec from the INTEGRAL position. We cannot determine at the present time whether the source is fading. Since this position is consistent with the one reported for the optical afterglow (Klotz et al. GCN Circ 19622; Sokolov et al. GCN Circ 19623; Rebolo et al. GCN Circ. 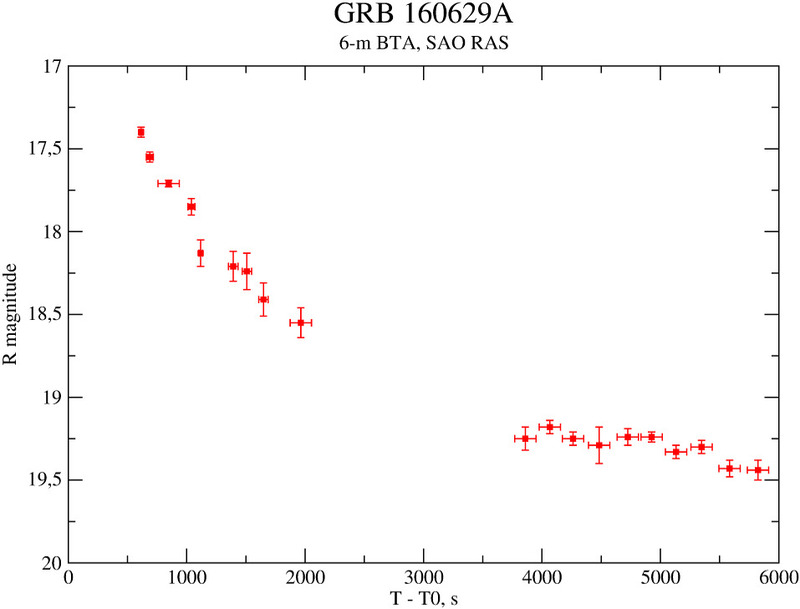 19638), we propose this source as the X-ray afterglow of GRB 160629A. The results of the XRT-team automatic analysis are available at http://www.swift.ac.uk/xrt_products/00020676. The results of the full analysis of the XRT observations are available at http://www.swift.ac.uk/ToO_GRBs/00020676. The magnitudes in the table are not corrected for the Galactic extinction due to the reddening of E(B-V) =3D 0.40 in the direction of the burst (Schlegel et al. 1998). We observed the INTEGRAL/IBIS GRB 160629A (Gotz et al., GCN 19621) with the AMI Large Array at 15 GHz on 2016 Jul 01.23, Jul 02.23, Jul 04.19, and Jul 08.19 (UT) as part of the 4pisky program. We detect a transient radio source consistent with the SAO RAS location (Sokolov et al., GCN 19623) at 219+/-49 uJy and 128+/-37 uJy in the first two epochs, and obtain 3sigma upper limits of 135 uJy and 243 uJy in the later two epochs.